Hien and Eugene’s serendipitous meeting led to their romance and eventually the proposal in the South of France. For the travel loving couple, Maui was an easy decision. Eugene is Australian and Hien is Canadian and Hawaii was the exact middle ground for both sides of their friends and family. The always-beautiful Olowalu Plantation House offered breathtaking scenery and Couture Events helped the couple design an intimate day that combined cultural traditions and relaxed romance.From the Vietnamese tea ceremony, to the ocean view ceremony, to the garden reception under climbing banyan trees and dressed in florals by Mandy Grace Designs, the day oozes casual elegance and it’s all captured to perfection by photographer Trish Barker. 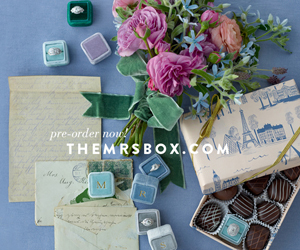 Will you briefly share your love story (how you met, the proposal)? We met by pure coincidence. Eugene was new to Toronto, having lived in Toronto for only about a few weeks when we first met. He moved from Shanghai, where he lived for 3 years for a job. He was invited to a party by a few people he had randomly met at a restaurant. It turns out the party was taking place in the common entertainment room of my friend’s apartment building. Funny enough, that night I received a text from my friend telling me to come to the party, and by pure coincidence I was passing by in front of her apartment and naturally, joined the party. I don’t actually remember when we first met at the party, but I do remember at some point in the night he asked me a lot of questions and I was getting really tired of answering them! He then gave me his email at the end of the night. He was so new to Toronto that he didn’t have a cell phone yet. We dated for about 3 years and lived together for about 2 years prior to the proposal. He completely swept me off my feet and surprised me. We love to travel and so for Thanksgiving we went to the South of France — we’ve been before and absolutely love it there. I actually didn’t know we were going to the South of France until we go to the airport. I usually take the lead in planning our trips, and this time I insisted Eugene plan it, which he agreed to do, but in return, I had to agree to not ask about the trip — even where we were going It didn’t occur to me that he was going to propose, even when I knew of where we were going because we’ve been to the South of France before and said we’d go back when we had the chance. We stayed in a town called Eze which is located on a cliff between Monaco and Nice. Eugene proposed the first night we were in Eze, and completely caught me by surprise. We were sitting at the hotel terrace (common area for guests) and he said he had to run back to the room to go to the washroom — he has a thing about public washrooms, so I didn’t think anything of it — and when he came back he got down on one knee with the ring and proposed. I initially thought he was joking and actually said — don’t, don’t, don’t do it. I then figured out he was being serious and of course said yes. We topped off the night by heading into Monaco to celebrate. The evening was so memorable and fun! How did you select Hawaii as your destination? Picking Maui was an easy decision for us. Eugene is Australian and I am Canadian. Hawaii was the exact middle ground for both sides of our friends and family. What was your vision for the day? It was very important for us that the wedding be classy/elegant but not stuffy. 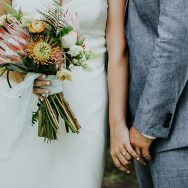 We wanted to create an intimate feeling and let our guests know how appreciative we were that they all traveled so far to celebrate our wedding day (more like week!). Overall, we wanted the day to be fun, and stress free. 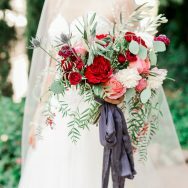 Please tell us about the style you were going for (flowers, outdoor setup, etc.). I would use the following words to describe the style we were going for: classic, simple, elegant, vintage, natural, romantic. Colours we stuck with were primarily cream and green, with grey blue as our accent. 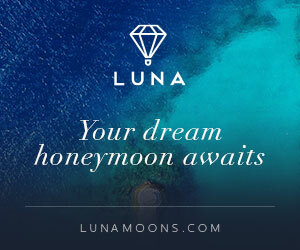 We’d love to know about your dress! Who was the designer? I LOVE my dress — wish I can wear it again and again! The dress is by Lea-Ann Belter a local Toronto designer. The dress was actually two parts. The main dress is called Divine by Astrid & Mercedes. I then had a lace top made, but in the same lace fabric as the skirt of my main dress. I wore both pieces during the ceremony and for most of the photos, during the reception, I took off the lace top. Any other special details you’d like to share. We also had a Vietnamese tea ceremony before the Western tea ceremony. The ceremony starts off with the groom’s side of the family bringing gifts to the bride’s side of the family. The groom’s father asks the bride’s father for permission for his son to marry the bride-to-be. 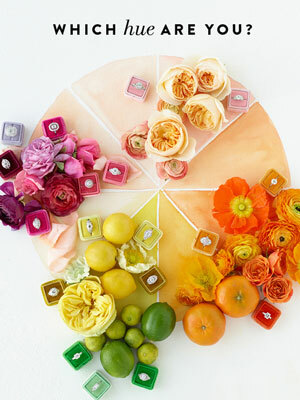 Once gifts are exchanged the bride and groom then serve tea to the parents and in return, the parents provide advice for a happy marriage. Following that, the groom’s family puts on jewelry for the bride as a symbol of welcoming her into their family. 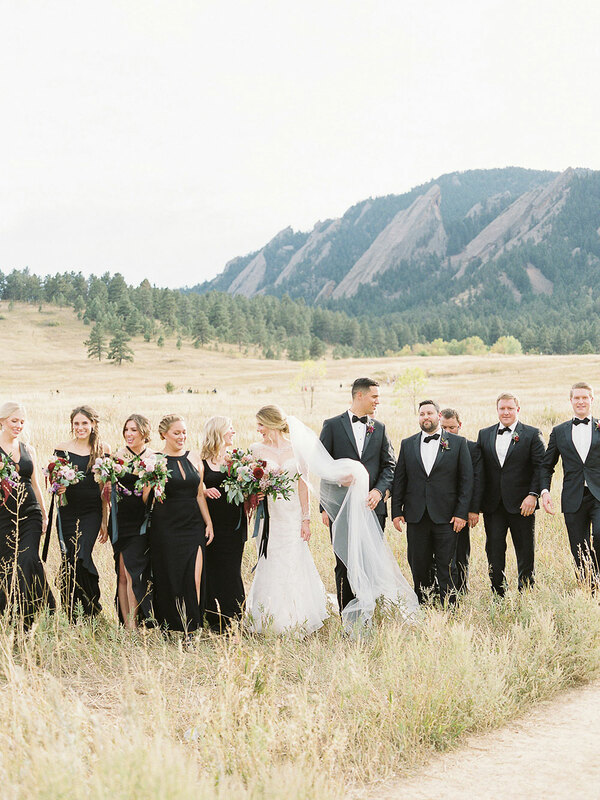 Kate and Jeff’s wedding at Boulder’s St. Julien Hotel was the destination wedding the couple dreamed of—a stunning, scenic location with travel accessibility to their dearest family and friends. 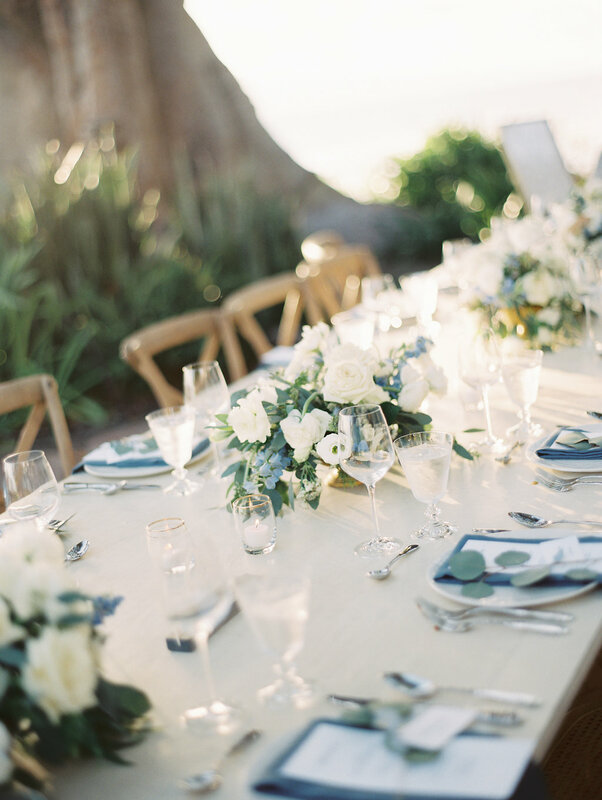 Self-proclaimed “professional wedding guests,” the couple knew exactly what they wanted in a reception—an ideal seating layout where each guest had a great view. 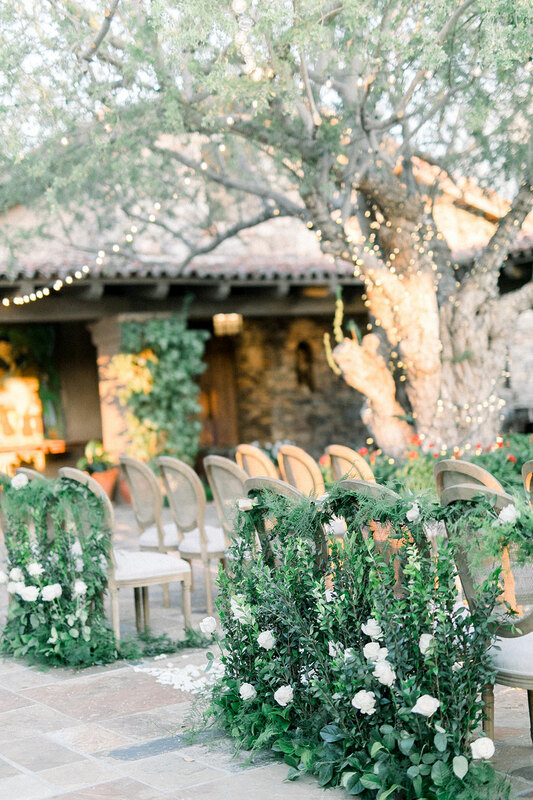 With the help of their planner Banks & Leaf , there was no bad seat in the house—a house decked out in elegant details and stunning florals by Statice Floral Design. 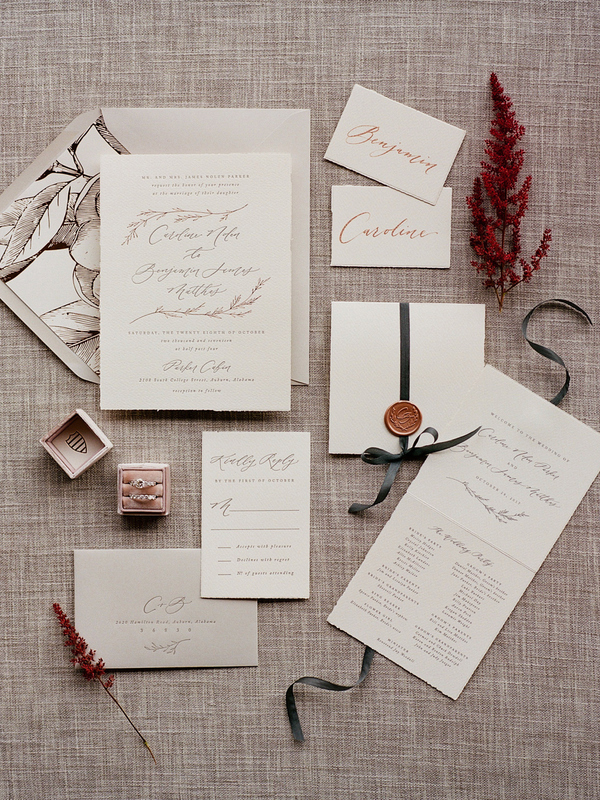 Lucky for us, Callie Hobbs Photography captured the day with her signature style in the beautiful images below. 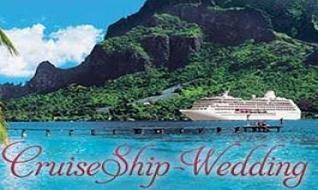 It was special to us to have destination wedding that was in an accessible location. Boulder was a perfect choice, especially since we had a lot of friends that were pregnant at the time. 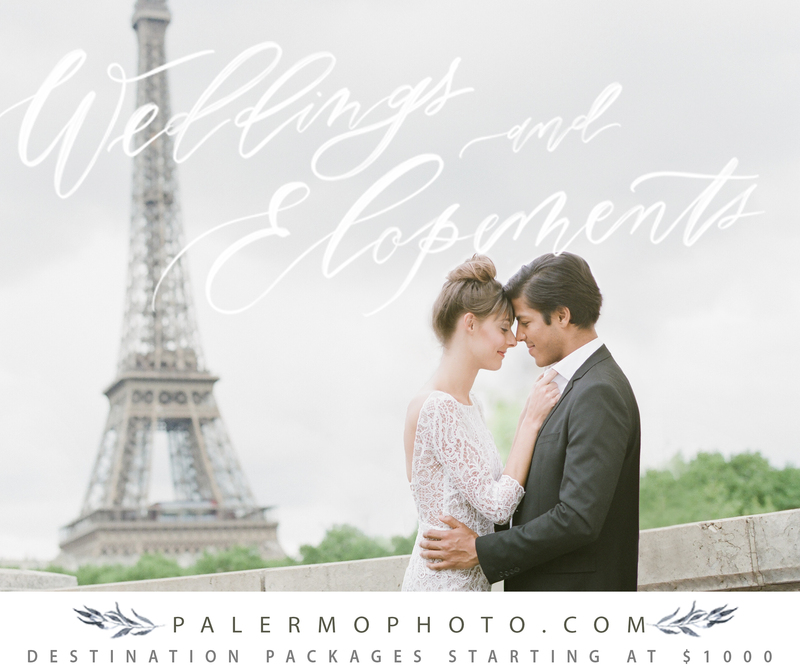 A destination wedding also has a different vibe since everyone was treating it like a vacation. Our wedding was on the smaller side, with 80 people, so it was imperative to Jeff and I that all of our guests felt included in every aspect of the weekend, especially at the reception! We’re basically professional wedding guests, and have experienced a few weddings where all the friends were sat at a large round table in the very back of the room, where it was hard to see or hear what was going on. When we had our final head count confirmed, we went back to the St Julien layout to rearrange everything a few weeks before the wedding. 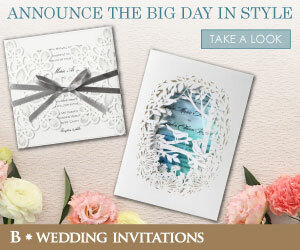 Jeff and I scoured Pinterest, along with every wedding magazine and website, to look at layout options. We fell in love with a U-shaped layout from an outdoor wedding, the only thing was we had to make it fit in the room at the St Julien. During our final walk through we worked with Gabby and multiple staff members at the St Julien, walking through different options and taping off measurements, making sure no one would have a bad view and while also trying to optimize the layout for the servers. It was so stressful at the time, but on our wedding day it paid off in spades. Looking around the room during the toasts, speeches and dances, everyone was engaged and best of all, we could see every person’s face! Looking back, it was one of the best decisions Jeff and I made! I went into the dress searching thinking I wanted an ethereal, bohemian wedding dress. I tried on a bunch that I really liked but wasn’t necessarily in love with. I was in Denver for Thanksgiving and decided to make an appointment at LWD. It was one of the first ones I tried on. I remember thinking my mom wouldn’t like it for some crazy reason. Then when I came out of the dressing room she started crying! Since my family is just a bunch of group criers my sister and I both started crying and it turned into one of those cheesy but touching moments that I look back on. Jeff’s mom’s side of the family comes from Guatemala, so it was important to us to incorporate his heritage into the ceremony. His grandmother did the second reading, doing it first in Spanish then followed by English. It was beautiful. We also incorporated arras (wedding coins), which is a Spanish tradition where the groom gives the coins to the bride followed by the bride giving the coins to the groom as a symbol of marriage and commitment to each other. We also incorporated El lazo which was essentially a large rosary in a figure 8 that was placed on our shoulders during the ceremony, symbolizing everlasting love and unity. Multiple guests came up to us at the reception and the brunch afterwards, commenting how much they loved how we personalized the wedding. We weren’t able to bring our dog out to Boulder so my step-dad surprised us with a life-size cut out of our dog, Mowgi! Jeff was so surprised and absolutely loved it since they are best friends. He also made an appearance in wedding guests’ photos. For our guest book we worked with Simon Pearce since we wanted a unique guest book. They helped us pick a large vase that could be engraved. My stepmom decorated the paper for guests to sign. All of the guests wrote well wishes on the paper that was then sent to Simon Pearce to be engraved. I could never choose just one memorable part of the day! One of my absolute favorites was at the ceremony, when the doors opened and I walked down the aisle looking at Jeff. I was experiencing so many emotions, I could not stop smiling. Just being surrounded by so many people you love is a surreal experience. I still remember that feeling. I will remember that for the rest of my life! In the car on the way over, Jeff’s sister led us in yoga breathing ending with OM before we walked out of the car. The calmness carried through the entire ceremony. My stepmom actually introduced us! I had just moved back to Chicago from the east coast after a break up and was living with my sister when my stepmom texted me saying, “don’t kill me but I told one of executives we work with about you. He’s TALL!! !” He then messaged me on LinkedIn. We finally met up at brunch a few months later and were inseparable since then. I was in no rush to get married, I actually didn’t want to get married. One Friday after a friend’s birthday party, he told me he had a surprise. Jeff is a very carefree person, so I assumed it was something small, like a piece of jewelry or my favorite type of wine. When he called me in the other room, I walked over and there were flowers EVERYWHERE and he was waiting there on one knee. I instantly started crying and made him walk me through all of the details of how he got here before saying yes. Blame my OCD. However, he had thought of everything! Our close friends were waiting outside for us afterwards, and he had the whole weekend of celebrating planned with friends, siblings and family. It truly was an experience I will never forget! Julie’s dad convinced her to try online dating and wouldn’t you know that her first—and only—date ended up being the love of her life. 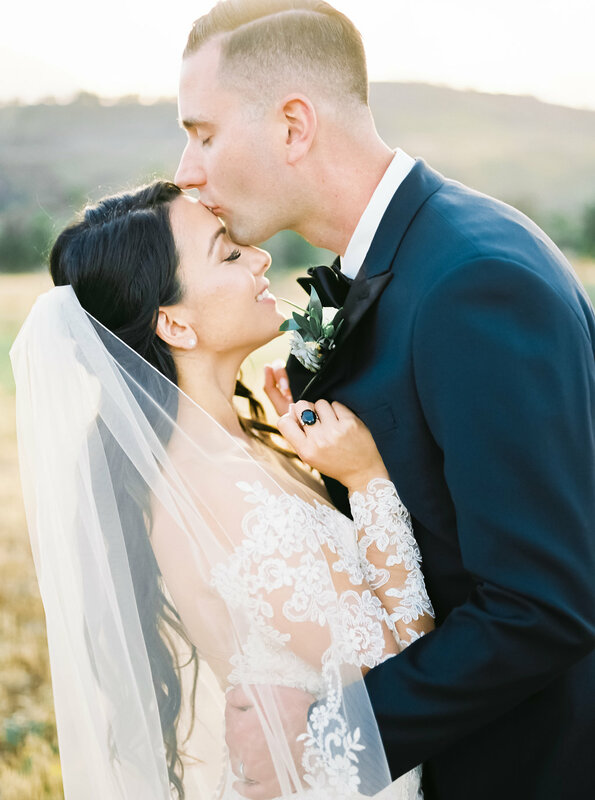 Julie and Christian, both California transplants from the East Coast, celebrated their wedding at the picturesque Franciscan Gardens. 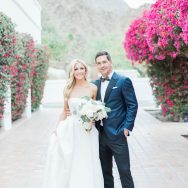 Traditional romance with touches of blue add personalization, but the couple elt the stunning beauty of the venue grounds take center stage. 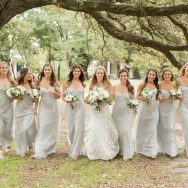 We love the soft, voluminous white florals by Florals by Jenny and the bride’s lace gown and classic cathedral length veil, but it’s the always-amazing work of Natalie Schutt Photography that captures the beauty of the coupe on their big day that has us swooning. We were very selective on choosing who attended our wedding. 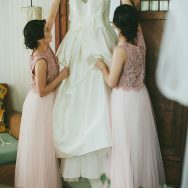 Our wedding comprised of family and only close friends of ours only, and I think having a smaller size wedding of 95 really made for a more intimate feeling and gave us time to chat with everyone. 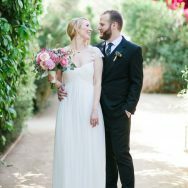 Tell us about the gown and where/how you found it? 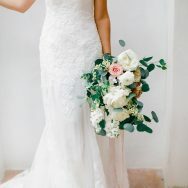 I knew I wanted a long sleeve dress and I chose a champagne color to really accentuate the white lace detail instead of choosing an all white dress that would have not emphasized the lace as much. 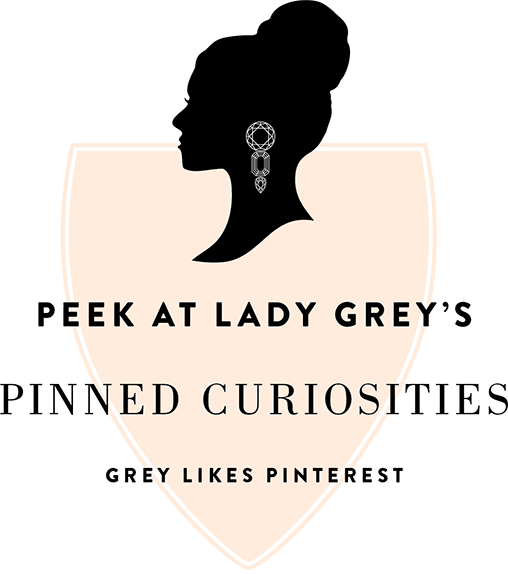 I originally found a similar style on Pinterest and once I had the designer name I went on a hunt to find who carried that designer. It ended up being a small boutique bridal shop in Torrance called Bridal Elegance. It was the second dress I tried on and it was a tough decision, but in the end I had to go with my gut feeling and what I initially envisioned because the assistants at the bridal shop make you try on a lot of different styles. We really wanted personalized everything! We had personalized mints and chapsticks in the restrooms for when guests freshened up. We had personalized napkins for cocktail hour along with personalized seasoning at every seat to ensure our guests left with many goodies that reminded them of the good time. 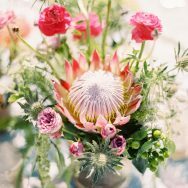 I have a very close eye when it comes to attention to detail and planned the whole wedding myself with my husband’s input of course! 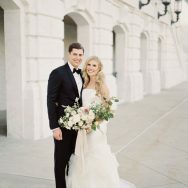 We couldn’t really pick a specific memorable time as I remember the day so vividly, but if I’d have to choose it would be the first look where we shared smiles, laughs, tears and an embrace that I will hold close to my heart for a lifetime. Let’s start by saying Christian and I are both from the East Coast. New York and New Jersey. It is really hard to meet people in California if you didn’t grow up here, so needless to say I didn’t want to meet a guy at a bar or a club and my Dad actually told me to try match.com. This was in 2012 way before dating apps were a thing. Christian was my first and only date from that website and I knew it was fate. How do two people from back East meet on the far West Coast? He was everything I was looking for in a man. Genuine, kindhearted, stunning blue eyes and had the personality of an East Coaster. It was March 17,th 2017 and Christian’s mother asked if I could help out her real-estate friend by serving champagne after work for an open house. I agreed because you never say no to your boyfriend’s mother when she asks you for a favor. I practiced and watched YouTube in anticipation so my champagne opening skills were flawless. I arrived in a nice simple dress at the open house “before it started” to help set up and met with the realtor. The realtor expressed that we needed to go in the backyard where there were steps leading down to Crystal Cove state beach and he explained, he really wanted to “sell the view, so the set up will be down at the lookout.” I mentioned I was very familiar with the lookout as my boyfriend and I always walk there every weekend. (On our walks we talk about life, goals and aspirations for ourselves/relationship). As we exited the gate, leading to the path there was a sign: “Honey, Hurry Up à” pointing in the direction of the look out where I saw a path of flowers with mason jars filled with candles and my soon to be husband awaiting my arrival at the lookout point. I started crying and pretty sure hyperventilating when I saw his friend pop out of the bushes taking photos of my reaction. I truly couldn’t believe what was happening to me at that very moment; it was a true out of body experience that I did not see coming. I thought I was popping bottles of champagne that night, never did I think I was getting engaged! Christian & Julie | Highlight Film | Franciscan Gardens | San Juan Capistrano, CA from Emma Lynn Cinema on Vimeo. 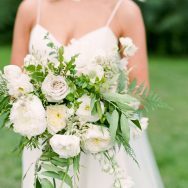 We are completely holi-dazzled by Caroline and Ben’s Auburn, Alabama wedding. 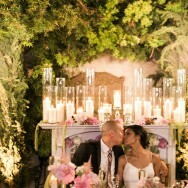 Invision Events planned the day with help from florist The Flower Store and stationer Linen & Leaf. The deep maroon palette is the perfect twist on traditional holiday colors and keeps things totally timeless with a multi-seasonal appeal. 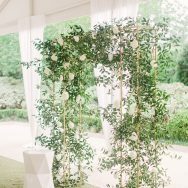 The details are stunning—a lush ceremony arch, letterpress calligraphy, wood-mounted custom signage, embroidered cocktail napkins, suspended greenery structures and flowers everywhere—and the best part is that it was all set against the backdrop of the bride’s family cabin at Parker Hill. 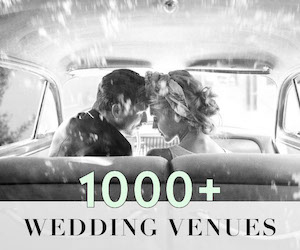 The family property is also a venue and Carline and Ben’s wedding was the first to be celebrated there. 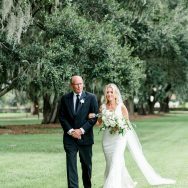 Lucky for us, the couple enlisted the skills of our friend Davy Whitener Photography to capture their day and the images are stunning. The wedding was unique to me because it was freezing and raining most of the day! We had to do a last minute rain tent for ceremony, but it ended up all working out and was beautiful. We were all close together and huddled up! And our pictures turned out beautiful! My mom and I found the Rivini gown in Atlanta at Lori’s Bridals where “Say Yes to the Dress” is filmed. I had looked at several other places, but when I tried this one on it was that feeling of “THIS IS IT!” It fit me like a glove so I didn’t need to do many alterations and the veil really sold me on the dress as well. We did a lot of personalization like most people do from the napkins to the cups, but I think the biggest thing was having the wedding at our family cabin. My dad renovated it for the wedding so none of our guests had ever been there! It was our own style from the actual venue down to the décor! The vows were the most memorable part of the day for me! Our longtime family friend married us and my aunt read a poem that my grandmother – who had passed the year before – had written years ago about getting married on a rainy day. 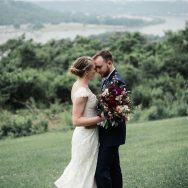 It was so surreal that it was actually raining on our wedding day! I felt like my grandmother was with us at the ceremony. We met in Destin when I was on a girls trip in 2015. I vacationed in Destin a lot and had a friend that was living there. We ran into him and he introduced us! Ben deployed to South America a week later for six months. We kept in touch and when he got back to the states we immediately started dating. The engagement was very low key! We were living in Destin and on the way to dinner he said needed to get something from my parents beach condo that he had left there. We went out on the balcony and there were flowers and he got on one knee and asked! It was just us – very personal and sweet! And overlooking the ocean which is a big part of our life!